As winter approaches, my kitchen (and my stomach) is calling out for winter comfort food! My other half and I enjoyed this soup for dinner tonight. It was quick and easy to make, and used things we already had in the cupboards. It's vegetarian, full of goodness, and low in fat. The other half added chilli paste to his serving as he's a spice fiend, but it all comes down to personal preference. Heat a large saucepan and dry fry the cumin seeds and chilli flakes for a minute. Or until they start to jump around the bottom of the pan and start to release their scents. Add the onion and oil to the pan and cook for 5 minutes. Stir in the lentils, stock and tomatoes and bring it all to the boil. Simmer for 15 minutes or until the lentils have softened. Use a hand blender on the mixture, or pop it into a food processor until it reaches the consistency you want. 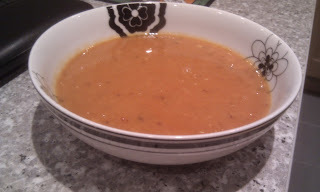 Pour the soup back into the pan to heat, add the chickpeas and season. Serve with a dollop of yoghurt and some coriander leaves (if using).